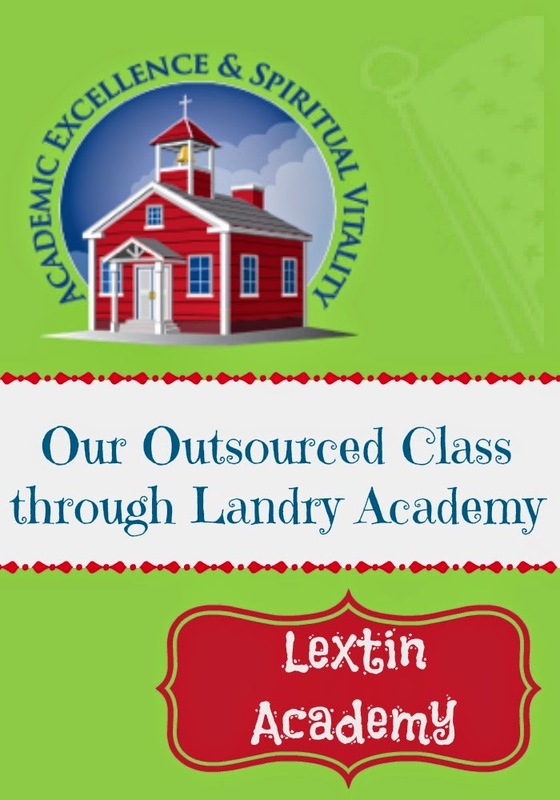 This year I decided at the very, very last minute to put Curly into an outsourced class through Landry Academy. I had a great coupon and the online classes just sounded so fun. Really, what I was thinking about most was the amount of time that someone else would be teaching her. I would have a short break while knowing she was working on something productive. I would also know that I had to do nothing to prepare for that class. Someone else could share their passion and knowledge with Curly and I could focus my time on something else. That sounded absolutely blissful. So, I looked through the course catalog and found a literature class about the Chronicles of Narnia. We love those books and read through the entire series last year! They are exactly at Curly’s reading level so the class sounded like a perfect fit. I did have a slight problem since Curly is only in 3rd grade and the class is for 4th-6th graders. I contacted Landry and talked to the head of the English department. After a long discussion about Curly and the requirements for the course, we both agreed that it would be a good class for Curly and that she would do well. I excitedly signed her up! We gathered our course materials. I printed out her syllabus and the course information. I helped her set up an account online so she could access the online class. She found the set of Narnia books and I ordered her the biography of C. S. Lewis that was also part of the required reading for the course. Because we signed up late for the class, we had to listen to a recorded session of the first class. So, that night Curly and I sat on the couch together and listened to the entire hour and a half session of the first class meeting. I helped her make a list of her homework assignments which included a reading assignment and a journal entry. After that night, Curly attended her live class sessions on her own. She kept track of assignments and wrote her many journal entries. She created a project with pictures of London, C. S. Lewis, and historical pictures of the time period in which he lived. Then each member of the class submitted pictures of their projects and the teacher shared them during the class. Curly is now working on creating webpages that outline the plot, setting, and characters of the 3 Narnia books that they have read during their class times. She adds pictures, videos, illustrations, and her narrative text to create a finished page that is a visual summary of the main events and people of each book. What have we thought about the class? The teacher has been very sweet and enthusiastic. She gives great feedback and has really encouraged Curly to continue to read as well as take charge of her own reading, discover her favorite genres, and find books that she enjoys. The class time has some lecture with power point slides and also contains discussions, short quizzes, and other interactive elements. She does a great job of making sure the students are engaged for the entire time period of 90 minutes. The material has been perfectly on target for the age group. Curly is expected to write only a few paragraphs for her journal entries and some of the assignments include an option to draw or illustrate rather than solely do a narrative. I have enjoyed reading Curly’s thoughts from her journal entries and seeing her work independently on her projects. This class has allowed Curly to full express herself through her writing. Somehow, writing for someone other than me has given Curly new motivation to dive deep into the material and think through the questions. She puts forth her best effort in this class and I have enjoyed watching her excel. I have loved that Curly is accountable to someone else. She completes her work and receives feedback from an outside source. Curly is also excited to attend class each week. She enjoys chatting with the other students and learning from the teacher. It has been a perfect solution to add a new dimension to our school year while giving me a little bit of a break. Through our experience, Curly has reached a new level of personal responsibility and is managing her time well. I’ve helped her think about a timeline for completion of her projects and encouraged to start them early and try to finish before the deadline. She has felt such a sense of accomplishment and achievement with each journal entry and each project that she has completed. Next semester Curly will be enjoying a marine biology course (using the Apologia text) from a teacher in Florida who records her class live at different bodies of water and even has multiple class pets. We are both so excited about our next class! I never thought I would enjoy an outsource class so much or that I would even consider one for the elementary level. However, this class has become a highlight of Curly’s week and I can relax knowing that she is learning from an enthusiastic and patient teacher who encourages her to keep reading, questioning, and exploring. After this experience, I plan to continue to sparingly use outsourced classes to enhance many of our homeschool years.